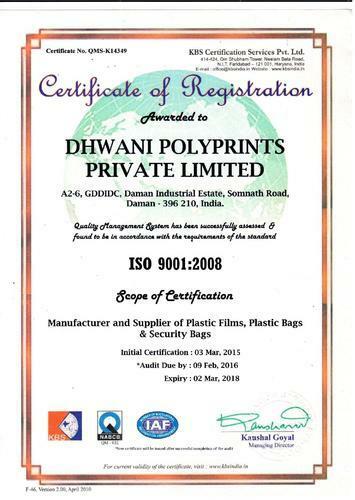 Established in the year 1996, we "Dhwani Poly Prints Private Limited", We are Manufacturer and Exporter of Duty-Free Bags, Plastic Films Rolls, Security Bags, Micro Perforated Bags, Courier Bags, Shopping Bags, Box Polyethylene Bags and much more. Inspired by globally advancing packaging solutions, Dhwani Polyprints introduces SoundSeal™, A whole new range of tamper-proof security packaging solutions for a wide range of applications. From pioneering the manufacturing of extruded mono-layer Polypropylene films in India over three decades back, today, Diamond Polyplast has evolved into a multi-dimensional producer of extruded mono-layer film based products. Diamond enjoys an impeccable reputation for its quality, consistency and service. Our customers spread across sophisticated and highly demanding international markets like Germany and U.K. Besides, we cater to the needs of several consumer and industrial products manufacturing companies, service providers, retailers and utility organizations across India. We pride in the list of our prestigious customers and constantly strive to serve them better. Our vertically integrated manufacturing facilities are located at Daman, about 170 km. from Mumbai producing approximately 6000 tons per annum from world-class polymers under strictly followed quality management systems. The company constantly invests in modernization, capacity expansion and value-addition enabling it to keep pace with its customers’ ever-evolving needs for the new film based packaging solutions. Prestigious awards for highest exports from the country from Plastic Export Promotion Council, Government of India in succession are the standing testimony of our consistency and performance. 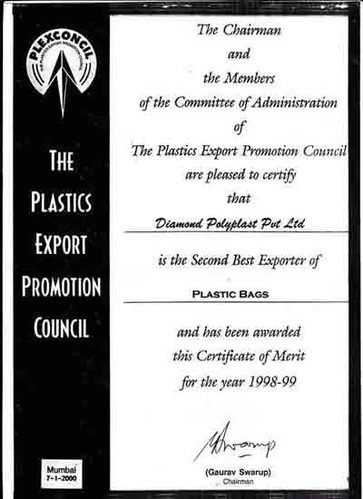 The Plastics Export Promotion Council. To expand business operations while following high ethical and social standards in dealing with our customers, employees and business partners; ensure customers’ delight by delivering a consistently high quality of products and services; Stay ahead by keeping pace with the latest advances in materials and technology. To emerge as a leading company in the field of polymer processing, which is internationally competitive, efficient and reliable business organization, providing comprehensive solutions to its customer''''s needs while keeping pace with global opportunities in this business, achieving consistent growth and ensuring the welfare of its stakeholders, society and environment. UK, Dubai, US, Canada, Qatar, Ghana, Nigeria, UAE, South Africa, Bangladesh, Nepal, Sri Lanka, Yemen, Kuwait, Bahrain.